Cheap Mini Sports Ducks - 12 Ct. These rubber duckies can be used for so much more than just bath time fun. 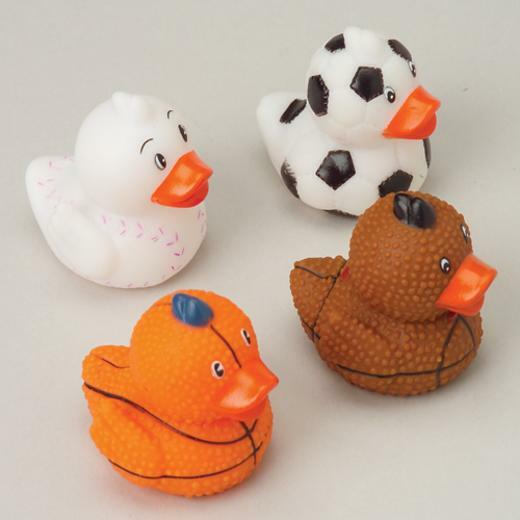 These vinyl rubber duckies have basketball, football, soccer ball, and baseball patterns covering their bodies. The ducks will float but are not weighted so they will not float upright. 1 3/4" Long x 1 1/2" wide x 1 1/2" tall. Great to use for small scale carnival games or as party favors. These ducks do not squeak. L: 9.05 in. W: 1.9 in. H: 9.05 in.